Tom Frieden, M.D., M.P.H., Director of the Centers for Disease Control and Prevention, joined by a panel of experts, called on everyone age 6 months and older to get their annual flu vaccine as soon as possible. Latest U.S. flu vaccination coverage estimates show highest coverage in youngest and oldest age groups with gains in school-aged children, but coverage remains low for most adult age groups. Vaccination is the single most important step everyone 6 months of age and older can take to protect themselves and their families against influenza. 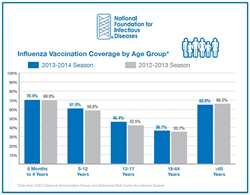 Influenza vaccination coverage estimates show an encouraging upward trend overall, but coverage among healthy 18 to 64 year-olds has yet to top 40 percent, according to new data announced at a news conference held today by the National Foundation for Infectious Diseases (NFID). Studies show adults may not seek vaccination because they think influenza poses no risk to them, but public health officials point out that flu hit the 18- to 64-year-old age group hard last season, with the highest flu-related hospitalization rates in this age group since the 2009 pandemic. Officials also highlighted that in addition to protecting healthy adults, vaccination would also make them less likely to spread influenza to others around them, including co-workers, young children and older parents. The latest influenza vaccination coverage estimates were announced by Tom Frieden, M.D., M.P.H., Director of the Centers for Disease Control and Prevention(CDC), and published in this week’s issue of CDC’s Morbidity and Mortality Weekly Report and on CDC’s FluVaxView website. In total, 46.2 percent of the entire U.S. population age 6 months and older was vaccinated during the 2013-14 season (up 1.2 percentage points for the country). Coverage was highest among children younger than 5 years old (70.4 percent) and adults age 65 years and older (65 percent). There was an increase in coverage among school-aged children, up 3 percentage points to 55.3 percent among children 5 to 17 years old. Influenza vaccination coverage in pregnant women has increased from the very low coverage seen prior to the 2009 influenza pandemic, which was often less than 15 percent, and has remained steady over the past two years at about 50 percent. In contrast to these estimates, the vaccination rate for healthy adults 18 to 64 years old is 33.9 percent. Today, Dr. Frieden also announced new performance measurement data for acute-care hospital-based healthcare professionals (HCPs). The data indicate 82 percent of hospital-based HCPs were reported by their hospitals as vaccinated against influenza in 2013-14. This performance measurement provides a baseline for measuring changes in hospital-based reporting of HCP influenza vaccination in the future. Joining Dr. Frieden in his call for everyone age 6 months and older to get vaccinated against influenza, were William Schaffner, M.D., past-president of NFID and preventive medicine and infectious disease expert at Vanderbilt University School of Medicine; Paul A. Offit, M.D., pediatric infectious disease specialist at the Children’s Hospital of Philadelphia; and Laura E. Riley, M.D., obstetrician and director, labor and delivery at Massachusetts General Hospital and associate professor of obstetrics, gynecology and reproductive biology at Harvard Medical School. All four experts called on people to take advantage of the ample vaccine supply and get their annual flu vaccine as soon as possible. Leading by example, Dr. Frieden and other panelists got vaccinated against the flu at the news conference. Among the vaccine options are the traditional flu shot, a nasal spray vaccine, an intradermal vaccine given with a much smaller needle, a high-dose vaccine for people age 65 and older and an egg-free vaccine. One type of inactivated vaccine can be given either by a needle or by jet injector. All vaccines protect against the same three or four influenza viruses, which research suggests are most likely to circulate during the coming season. Vaccine virus selection for U.S. flu vaccines this season occurred in February of 2014. Experts also stressed the importance of vaccination against pneumococcal disease, which can strike any time of the year, but also can be a deadly complication of influenza. Pneumococcal bacteria cause a severe type of pneumonia, as well as meningitis, blood poisoning and other infections. Based on recent data showing added protection against pneumococcal disease, CDC today published new recommendations adding a second type of pneumococcal vaccine for adults age 65 years and older. These adults should first receive one dose of pneumococcal conjugate vaccine and then one dose of pneumococcal polysaccharide vaccine, ideally six to 12 months later. Either pneumococcal vaccine can be given at the same time as the influenza vaccine, but each pneumococcal vaccine is needed only once in a lifetime for most adults. All adults age 19 years and older need to be vaccinated with both pneumococcal vaccines if they have compromised immune systems, which can result from health conditions such as HIV infection or use of medications that weaken the immune system. Vaccination with pneumococcal polysaccharide vaccine is important for adults in this age group if they have certain risk conditions, such as heart, lung or liver problems, diabetes, asthma or are smokers. Depending on the risk factor, some adults may need as many as three doses of pneumococcal polysaccharide vaccine in a lifetime, but only one dose of pneumococcal conjugate vaccine is recommended. Only 20 percent of adults 19 through 64 years at high risk have received pneumococcal vaccination. Coverage among adults 65 years or older is better (60 percent), but there are still many adults left unprotected. Pregnant women and their developing babies are at increased risk of flu complications because of changes to a woman’s immune system, heart and lungs during pregnancy. For example, getting sick with the flu while pregnant doubles the risk of fetal death, increases the risk of premature labor, and increases the mother’s risk of hospitalization. Vaccination of mothers also protects newborn babies for up to six months, a period when they are particularly vulnerable to influenza but too young to get vaccinated. Infants of vaccinated mothers have a lower risk of hospitalization from flu during their first six months of life. The highest vaccination rates in pregnant women are among those who receive a recommendation and an offer of vaccination from their obstetrical or other healthcare provider. CDC received reports of more than 400 flu-related deaths in children over the last four years. Forty-seven percent of last season’s reported 107 pediatric deaths occurred in children with no prior health problems. Influenza vaccination is recommended for all children beginning at 6 months of age. In August 2014, CDC recommended the nasal spray vaccine as the preferred flu vaccine for children 2 to 8 years old if it is immediately available and there are no contraindications or precautions. However, CDC emphasized that vaccination should not be delayed if the nasal spray vaccine is not available; vaccination should proceed with whichever vaccine is available. Early vaccination is especially important for children younger than 9 years of age being immunized against flu for the first time because they may need a second dose four weeks later to have optimal protection. More than nine out of 10 physicians (92.2 percent) and nurses (90.5 percent) were vaccinated against influenza last season. Coverage for nurses was up from 85 percent the previous season. Coverage among other healthcare professionals also approached 90 percent (nurse practitioners/physician assistants at 89.6 percent and pharmacists at 85.7 percent). While the nation’s healthcare professionals are getting vaccinated to protect themselves and to make sure they don’t spread flu to their patients, there are some worrisome vaccination gaps. Hospital-based professionals are vaccinated at high rates (nearing 90 percent), but the vaccination rate is just 63 percent among professionals working in long-term care facilities. This difference may be partly due to stricter vaccine requirements for hospital workers, but that does not explain the entire gap. A high percentage of workers in long-term care facilities are assistants or aides (61 percent) and this occupational group has the lowest coverage rate regardless of where they are employed. The success in hospitals has been attributed to vaccine requirements for staff and providing it free to employees on-site. This season’s vaccines protect against the three or four influenza viruses research suggests are most likely to spread during the upcoming season: A/California/7/2009 (H1N1) pdm09-like virus; A/Texas/50/2012 (H3N2) virus; B/Massachusetts/2/2012-like virus and a second B virus – B/Brisbane/60/2008-like virus – in quadrivalent vaccines. While vaccination is the best way to prevent influenza, CDC outlined its three-step approach to fighting the flu. In addition to getting vaccinated, CDC urges everyday preventive actions such as avoiding close contact with sick people, covering coughs and sneezes, and regular handwashing. For those who do get infected, CDC recommends appropriate use of antiviral drugs in adults and children when prescribed by a healthcare professional as a second line of defense against the flu. Antivirals, oseltamivir, or zanamivir, can treat influenza illness and reduce the risk of serious influenza complications. The National Foundation for Infectious Diseases (NFID) is a non-profit, tax-exempt 501(c)(3) organization founded in 1973 dedicated to educating the public and healthcare professionals about the causes, treatment and prevention of infectious diseases across the lifespan. In addition to CDC, NFID was joined at the news conference by experts from leading public health and medical organizations including AARP, American College of Obstetricians and Gynecologists, American Academy of Pediatrics, American Pharmacists Association and Families Fighting Flu, among others. This news conference is sponsored by NFID and is supported, in part, by CDC, MedStar Visiting Nurse Association, Montgomery County Department of Health and Human Services and through unrestricted educational grants from AstraZeneca, BD Medical, bioCSL, Genentech, GOJO Industries, Merck & Co., Inc., Novartis Vaccines and Diagnostics Inc., Pfizer Inc. and Sanofi Pasteur Inc. NFID policies prohibit funders from controlling program content.